I have often said that turning the tables on liberals, such as publicly displaying addresses of gun owners in order to intimidate them or exposing the addresses of individuals aligned with the Southern Poverty Law Center will do wonders to demonstrate their hypocrisy. Lo and behold, that is just what has happened with two New York Times reporters who thought it a “righteous” thing to put out the physical address of Officer Darren Wilson, putting him and his new wife in danger. Now, their addresses are out in the open. On November 25, Right Wing News’ John Hawkins said he would link to anyone that published the home address of Julie Bosman and Campbell Robertson. It would be wrong, for example, to publish Bosman’s address at 5620 N WAYNE AVE APT 2 CHICAGO, IL 60660-4204 COOK COUNTY It would be similarly wrong to publish the address of Robertson, too. 1113 N DUPRE ST NEW ORLEANS, LA 70119-3203 ORLEANS COUNTY So why do journalists think they are beyond examination? How does it advance the story to know where Darren Wilson and his newly wed live? I agree, it does nothing to advance the story and Campbell and Bosman had to have known that putting the address of Wilson out was endangering his life. 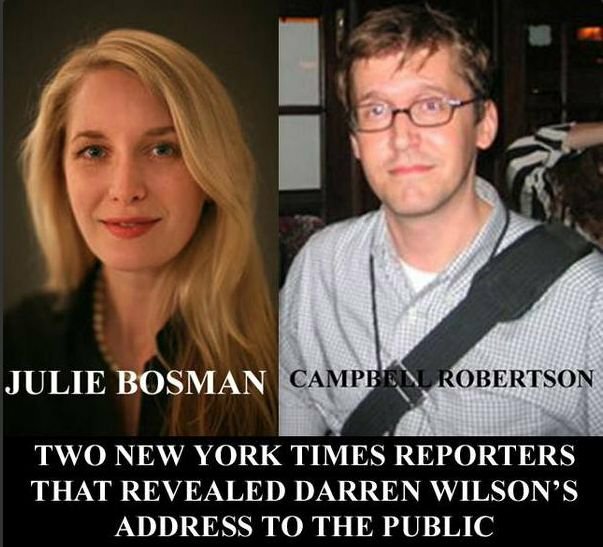 Of course, and no one if threatening the life of either Bosman or Campbell, but turnabout is fair play, and for good measure, commenters even provided Ms. Bosman’s phone number in case there were those interested in confronting her about posting Wilson’s address. However, look at the hypocrisy by some of the commenters in Johnson’s piece. Note, that they cannot distinguish between a simple retaliation and those that put out address information while knowing there was a bloodthirsty mob waiting to carry out murder. There was also retaliation by Connecticut citizens following legislators vote in favor of gun registration. While this author has no ill will towards either of these reporters and I don’t condone any unlawful use of their information, sometimes it is good to teach them a lesson that what goes around comes around. The internet is a big place, websites are popping up all over the place and the citizen journalist is becoming commonplace. Do these people really want to go down this road of knowingly endangering the lives of others and think they will not be outed? One would hope not, but the heart can be a desperately wicked thing. Let’s help keep it in check.